The snow that walks! 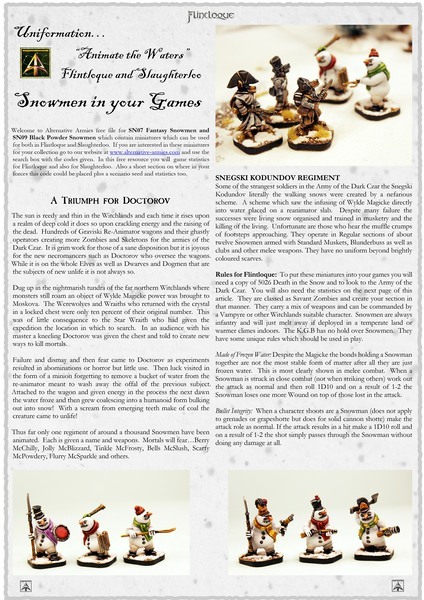 A free two page article for Flintloque and Slaughterloo players giving rules and more for our brand new 28mm Snowmen in these game systems. Click through to read more and to download the article from our website storage and a link to all the other free downloads we have for Flintloque. Cryptmass approaches and there is always time for Flintloque! This entry was posted on Thursday, December 6th, 2018 at 16:02 and is filed under News. You can follow any responses to this entry through the RSS 2.0 feed. You can skip to the end and leave a response. Pinging is currently not allowed.